When I was still in college, I spent four months of my senior year living at the Audubon Center for the Northwoods in Sandstone, Minnesota. It was one of the most wonderful times of my life and I learned more in those four months than I did during my entire four years of college. This was thanks to, primarily, the incredible and motivating teachings of Mike Link and his wife Kate Crowley. Last year, Mike and Kate took on Lake Superior, walking around the entire freshwater resource, educating and creating awareness for their beloved great lake. Next year, the pair want to bike up and down the entire length of the nation’s largest river system. 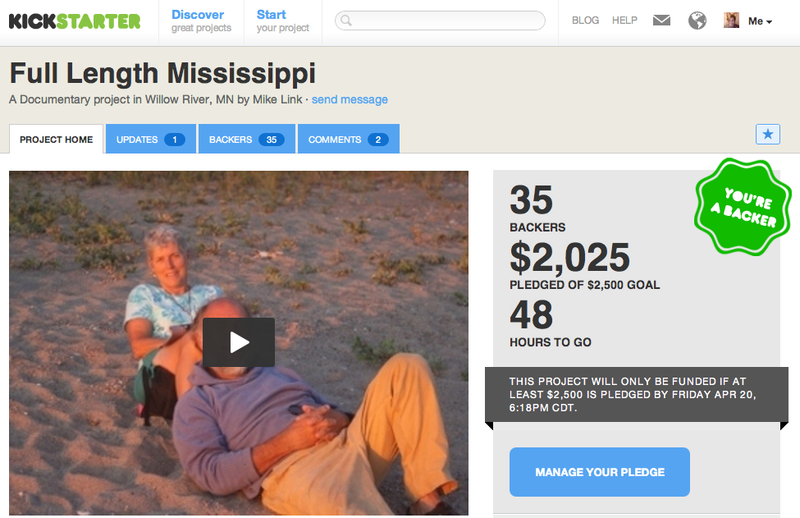 Their adventure has sparked the creation of the Full Length Mississippi Kickstarter Project. In less than 48 hours, the Full Length Mississippi Kickstarter project will end and they still need about $500 to reach their goal. This is an all or nothing campaign – if they don’t meet that goal, they get nothing. I am reaching out to all of you to please donate even just a little big. This endeavor can’t happen without you. Mike and Kate aim to raise awareness and educate the public about the health of our natures freshwater ways. They will bike the river and use their knowledge to create educational programs for schools and organizations and share what they discover along the way both in person and online. It’s an incredible journey and you can take part and help make this happen. Please support this project. I owe Mike and Kate a lot – they are inspiring people and have taught me so much. Help me help them by donating to this cause. Please support Full Length Mississippi! Update 4.19.12, 8:12 CST: We did it! Thanks to you amazing people, Mike and Kate reached their Kickstarter goal with 22 hours to spare! You all rock! THANK YOU!